This single vineyard Syrah from Chile's Cachapoal Valley is prime example of the stunning quality available from the prime vineyard sites in this country. 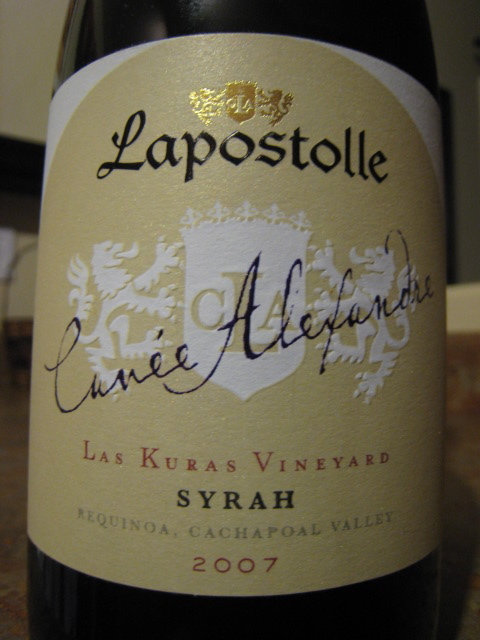 Casa Lapostolle has been making exceptional wines for the last decade or so and continue to impress with their Cuvée Alexandre wines. The Las Kuras Vineyard is located only 5 kilometers from the base of the Andes Mountain, on an old river bed. The soils are made up of alluvial terraces which are areas of shallow soils, with an abundance of round river rocks and gravel, similar to the Graves of Bordeaux. The high percentage of pebbles provides excellent drainage, great aeration and low fertility. Also, the stones trap the heat during the day to deliver it by night, creating a unique microclimate. This wine is made from 100% Syrah and was aged in French oak barrels (65% new oak, 16% second fill oak and 19% third fill) for 21 months. The color of this wine is a deep purple that carries an opaque core and only slightly gets reddish towards the edges of the glass. On the nose I get loads of black fruits such as currant and sour black cherry. There are also seductive aromas of cedar, spice, coco powder, tobacco, and black tea. On the palate the huge black fruits continue to dominate with black currant, black cherry, toasted oak, semi-sweet chocolate, and subtle hints of tobacco that make up this complex flavor profile. This wine is rich and textured, finishing with notes of graphite or pencil lead and a nice dose of dry tannins. Many thanks for the post and glad you enjoyed. Cheers to you and your passion for wine! Honestly saying with my dinner I am habitual of taking a glass of wine !! It is good for health ! !